During his postgame press conference after Wednesday night’s 62-52 overtime loss to San Diego State in the quarterfinals of the Mountain West Tournament at the Thomas & Mack Center, UNLV coach Marvin Menzies was surprisingly upbeat. “I still feel like the luckiest man on the planet who has had a bad day,” Menzies said. A cynic might suggest Menzies might feel fortunate that he won’t have to coach another game this season after the Runnin’ Rebels put the finishing touches on the worst season in school history with an epic second half meltdown, blowing a 21-point lead in the final 18 minutes of regulation against an almost equally offensively inept Aztec squad that managed a whole 16 points in the first 22½ minutes of action. But San Diego State (18-13), trailing 37-16 after a Jovan Mooring 3-pointer with 18:18 remaining, then went on 25-3 run to take a 41-40 lead on a 3-pointer by Matt Shrigley with 8:57 remaining. The Aztecs, who shot 14.8 percent (4-of-27) in the first half, went back into another offensive slumber after building a 50-46 lead on a pair of free throws by center Valentine Izundu, failing to score in the final 3:37. UNLV, despite losing Mooring (game-high 18 points) to fouls with 5:10 remaining, had several chances to still pull it out at the end of regulation, including when forward Christian Jones (16 points but just 4-of-8 free throws) went to the line for two free throws with 10.1 seconds left and trailing 50-49. But Jones sank just one of his two attempts and the Rebels then survived a potential game-winning jumper by Malik Pope to head into overtime. It was all San Diego State after that. 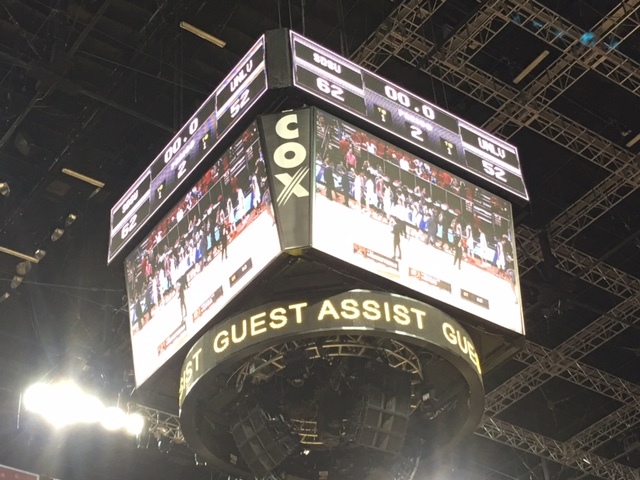 The Aztecs scored the first 12 points of overtime as the Runnin’ Rebels, who were without starting forward Tyrell Green (knee) and went with a six-man rotation most of the night, simply ran out of gas. Only a layup by freshman guard Zion Morgan with 9.7 seconds left kept UNLV from getting blanked in the extra period. San Diego State, outscored 15-14 by Mooring alone in the first half, rebounded to outscore the Runnin’ Rebels, 46-15, in the final 23:18. Menzies credited San Diego State’s fullcourt press, which forced nine turnovers after halftime, as being a key to the Aztec comeback. The 6-10 Izundu, who was credited with five blocks and altered about a half-dozen others, also was key in the Rebels making just six of 26 shots in the second half and overtime. Despite losing 11 of the last 12 games and suffering the school’s first-ever last place finish, Menzies remained optimistic afterward that he could turn things around. “I still feel like the luckiest man on the planet who has had a bad day,” he said. “We’re in a great city. We’re in a town that’s the mecca of basketball. We’ll be able to get players in here. That’s not going to be an issue. We’ve got a fantastic fan base. We had some loyal fans that suffered the worst record in the history of the program and showed up cheering to the last buzzer. You can’t make that up. For what it’s worth, Menzies’ old boss, San Diego State coach Steve Fisher, believes he’ll turn things around.